– I’m calling about the fall of Mariano Rajoy. You must be happy? – he said, as soon as I picked up the phone. – Happy isn’t the word for it. It’s like getting an aching tooth removed: a feeling of immense relief, followed by a raw tenderness for a few days after the numbness wears off. Rajoy has done a lot of damage to Spanish democracy and Spain’s international image. He has done most wrong, to paraphrase Yeats, to those close to my heart. – Don’t mention dentists to me. What exactly happened with this corruption case? I heard that the Partido Popular has been found guilty of taking illegal kickbacks from public works contracts to finance their election campaigns? – Right. The findings of the particular case which brought down Rajoy are centred on the illegal financing of PP elections campaigns in the Madrid commuter towns of Majahonda and Pozuelo. But crucially in terms of Rajoy’s ejection from office, in their verdict, the judges extrapolated a general practice from this and, equally importantly, also cast doubt on Rajoy’s own personal testimony as a witness in the case. The PP has been found civilly liable for having benefitted from these illegal practices. The only reason the PP was not found criminally liable is that the crimes were committed before Spain’s political party funding laws were passed in 2010. – Sam Jones in The Guardian describes this PP illegal financing as something done “unknowingly”. – Sam Jones must have been reading The Guardian’s sister newspaper, El Pais which, like much of the Spanish press, is presenting the story as a case of a few rotten apples in the barrel. But page 1515 of the sentence baldly states: “Those responsible in the Partido Popular knew how election campaigns were financed and, in our case here, the elections in Majadahonda and Pozuelo; to deny this is to go against not only the evidence on display in this case, but also every kind of logic“. – So the PP has been illegally funding its elections campaigns for, how long exactly? – Since 1989, when it was founded apparently. There is no mafia in Spain like there is in Italy, and one credible theory is because there is no need for one. 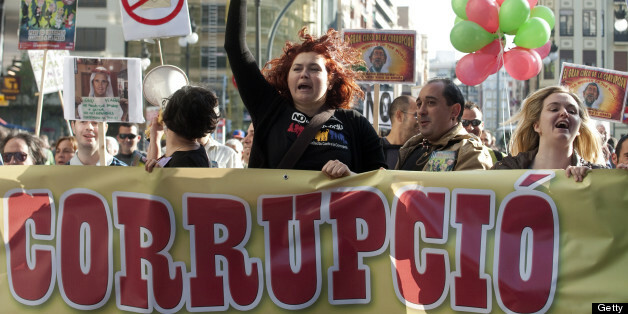 The PP has been working as a kind of mafia for decades and, in any case, is deeply entwined with the business interests of the Spanish oligarchy, right down to the most remote town hall in the most distant part of the country. – What about Rajoy himself, was he involved personally in this case? – No, though he was called as a witness and the veracity of his testimony was seriously called into question. Furthermore, in the parallel accounts manuscript which ex-PP Party Treasurer Luis Barcenas kept, there are annotations of payments totalling more than 300,000 euros over the years to a certain “M Rajoy”… But that wasn’t the case which was sentenced the other day. There are still several more cases to go before the courts where the same corrupt Gurtel network is alleged to have been at work. One of these concerns alleged periodic slush-fund cash payments in brown envelopes to leading PP figures like Rajoy over decades. Another concerns the alleged destruction by PP officials of the hard-drives of some of their own computers in the party’s HQ before the police could get their hands on them. 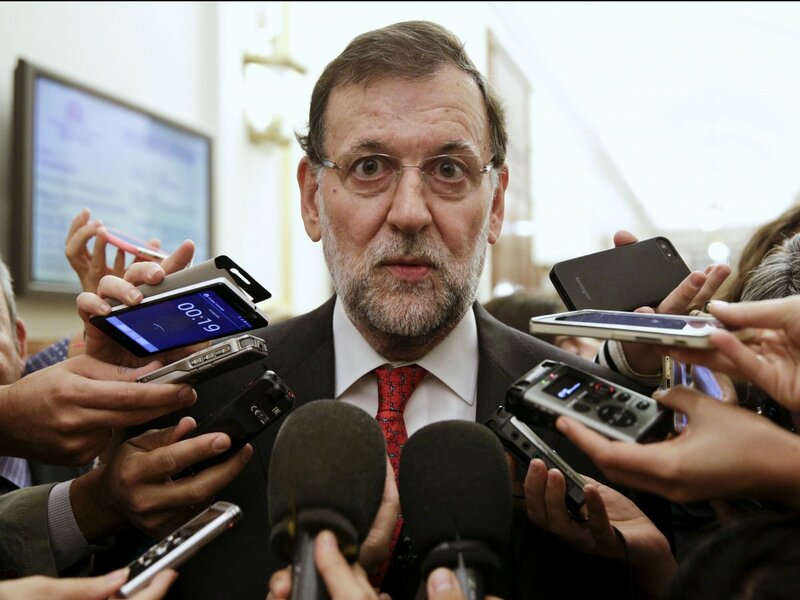 – Why didn’t Rajoy just resign as party leader and let somebody else from the PP become Prime Minister after the No Confidence Motion was tabled in the Spanish Parliament? Any British Prime Minister in such circumstances would have been quick to stand aside. – Because Rajoy is an ultra-Spanish nationalist, and an essential part of ultra-Spanish nationalism is a do-or-die, inflexible attitude only found in comparably extreme cases such as Ulster unionism. It’s an attitude which makes democratic politics very difficult. People like Rajoy are fanatical Spanish nationalists and any kind of concession is considered a weakness. Their thinking is emotional, not rational. Rajoy fell on his own sword, which is the steely hard sword of Spanish nationalism, fabricated in Toledo possibly. He didn’t have the political instincts to step aside, it took him almost a week to realize he had to resign as leader of the PP. – So Rajoy refused to make a move even though it was obvious his position had become untenable? – Correct, though to say he didn’t move would be inaccurate. In fact he was absent from parliament for most of the No Confidence Motion in what is one of greatest displays of contempt for Spanish parliamentary democracy ever. He walked out. – Wait a minute. Rajoy wasn’t even present for most of the debate on the Motion of No Confidence against the very same government he was leading? – That’s right, Rajoy abandoned the chamber during the No Confidence debate and took refuge in an extremely good restaurant in central Madrid for about eight hours, where he was joined by his coterie of sycophantic supporters. Some wags in the Spanish press compared the whole thing to Hitler in the Fürherbunker in Berlin in 1945. – And Pedro Sánchez, the leader of the PSOE, was given the confidence of the Spanish Parliament to form a government after the No Confidence Motion was carried on Friday the 1st of June? – Yes, he was supported by the Basque and Catalan nationalists and, most importantly, the 67 seats of Podemos, the third biggest party in the Spanish House. Indeed, when the results were counted and Sánchez declared PM; the Spanish Parliament rang out with the indignados’ cry of “¡Si se puede!”, roughly, “yes we can”. It’s certainly some journey for Pablo Iglesias and Podemos from the plazas of Spain to being instrumental in bringing down a corrupt PP government. But the PSOE-Podemos fellow-feeling is unlikely to last long. – Why do you say that? – Pedro Sanchez’s new government demonstrates great political savvy. Everybody has underestimated Sanchez, who has always come across as anodyne and aimless. But he has put together a media-friendly government, positioned politically in the centre ground, with the highest number of female ministers in the history of European democracy. It looks modern and progressive in terms of civil rights, gender equality and the environment, but essentially conservative in terms of the economy and the unity of Spain. Sanchez will offer talks with Catalan nationalists, but not a referendum. But that may be enough to break the stalemate. Catalan nationalism is split between those looking for a truce in an unwinnable war and those, like Puigdemont and the CUP, who want to carry on with the attrition. Above all, Sanchez’s cabinet is designed to win the next Spanish General Election. – Getting back to Rajoy, what is his legacy? – I would say that, more than the hundreds of corruption scandals, whose origins in most cases date back to the PP under Jose María Aznar, Rajoy’s most damaging legacy is to have turned back the clock on democracy and civil rights in Spain. I’m talking about his infamous “gag law” which has led to people prosecuted for tweets, his law making it a crime to “offend the honour” of the Spanish monarchy, and which has seen several Spanish Rap artists processed for their lyrics – one of whom, Valtonyc has fled to Belgium, just like Puigdemont – and of course his intransigent and authoritarian handling of the Catalan situation. Let’s not forget there are still ten Catalan politicians in jail, and they haven’t even been found guilty of anything. – It is surely indefensible to lock up democratically elected and peaceful Catalan politicians, even more so before they have even been tried? – It is totally outrageous and, politically speaking, a dereliction of duty. Rajoy failed to do his job and offer any kind of political solution, effectively passing the buck to the Spanish judiciary. – Anything of interest from Scotland’s point of view? – Well, Pedro Sánchez is the first Spanish PM ever to speak English, which makes communication a lot easier. I also noted that, during the No Confidence debate, Sánchez, when addressing the Catalan nationalist MPs, specifically referred to the fact that Scotland and England signed an international binding treaty in 1707, thus distinguishing the Scottish case from that of Catalonia. That augurs well. As for Rajoy, I am sure that many Scots, like me, will remember him for breaking all rules of European diplomacy by staging an official press conference on the eve of the Scottish independence referendum, in which he declared “The only way Scotland can be sure of remaining in the EU is by voting to remain in the Union with England”, only for him to then contemptuously declare a few months later, just after the Brexit vote, that “If England leaves the EU, the Scots do too…”, effectively sabotaging Nicola Sturgeon’s visit to Brussels before she was even off the plane. In Spain, he will also be remembered for some of his ludicrous lines and malapropisms which read like an exquisite corpse. – An exquisite corpse? You mean like the game the French surrealists used to play? The PP still have a majority in the upper chamber, so they can still cause problems for the new government. Ciudadanos and Podemos currently have more support than the old right and left, PP and PSOE, so populism is still a danger to a minority socialist government. There is a theory that the PP even conspired with PSOE, Basques and Catalans to put off any new elections, keeping Ciudadanos from winning until the old parties had recovered ground! I therefore hope your analysis is right about Sánchez, but I have my doubts. I notice you do not say anything about the puppet president Torra and some of his xenophobic views and right-wing extremism that so divides the Catalan nation (one of the main differences with Scottish nationalism). If the Catalans did succeed with secession, they would be joined by the Basque-Navarrese axis making the rest of Spain economically non-viable. Andalusia, the largest autonomy and the most populous, was always just as repressed, supplied the labour force to build Catalonia economically, yet has never had the investment and favours Catalonia had. I know of several cases where even today they are ostracised because they still consider themselves Spanish and want to speak and learn Spanish, but the education system subtly blocks the teaching of Spanish. So, frankly, secession would balkanise Spain. No matter how abominable Rajoy was and stupid in his intransigency with the Catalans, Puigdemont himself was just as much a clown to jump the gun on the long-term plan of Pujol and Mas to ‘catalanise’ the region fully through the education system and thereby ensure an eventual majority instead of the rural-biassed voting system that gives more seats to secessionist regions but not the overall popular vote, notably the business urban centres. Most of the rest of Spain therefore had little sympathy for Catalonia for the simple reason it would destroy Spain, not because they backed the PP’s stance in any way. The danger for the SNP and Yes movement in Scotland in equating itself too closely with the Catalan cause is that it will put further doubt into the minds of ‘non-native’ Scottish citizens who already notice a change in attitudes, especially towards sassenachs living here but also other Europeans many of whom have so far backed independence, together with the SNP as the party to deliver it. ‘Aching tooth? Drew Spiers, from the University Delavida’ Really? Love it. Laughs aside though, M. Rajoy represents a particular form of traditional institutionalised corruption. Most independent analysts believe that he will be charged in due time for having led the operation. On balance, vis-a-vis his Scotland jibe, May was in cahoots with him for the obvious reasons. That situation might change now. We’ll have to wait and see. As for the new govt, that ‘fellow feeling’ with Podemos never really started. Podemos has been completed excluded from any significant role in the new government despite having given PSOE the votes they needed to win. Fair enough, Pablo Iglesias never laid down any conditions for that support, but this is the second time that the PSOE has betrayed Podemos. Needless to say, many leftie PSOEists will also be disappointed. With every party scraping about in the anodyne-yet-fertile centre ground looking for votes for the general election (the PP now define themselves ‘centre right’ and the PSOE as ‘centre left’), they all seem to be as populist as each other. The University Delavida never makes it onto the rankings, but it’s the best in town… you know it and I know it, Rob. As for this Wilson character, he’s not much of a friend if he doesn’t even know how to spell my name properly… and you’re right about “aching tooth”… what kind of an expression is that? … and my bet is it goes right to the very top of the whole Spanish establishment… right to the top.